This easy to crochet baby dress for 2-3 months old girl requires 100-120 g of thread, a steel hook No 8 (1.5 mm). If you don't have this kind of hook, No7 (1.65 mm) or No 6 (1.8 mm) can do the work. To make a project you don't have to be an experienced crocheter. Just do your own calculations following step by step my example. Let's look at our mode,l to understand what we are going to crochet. As usually, I don't suggest you to follow my example exactly. Choose your own pattern, color and type of thread, and number of hook. The best idea while doing a crochet or knitting project is to follow a garment pattern with your own calculations. This way you will never have any problems with mismatching gauge or over sized / undersized dress, sweater, top, and etc. 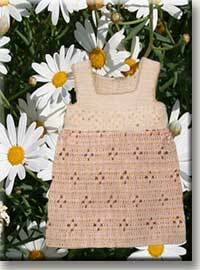 This crochet baby dress has three stitch patterns to follow. Check for the International Crochet Symbols if necessary. Crochet Baby Dress. Step-by-step instruction. Pattern 1. 20 sts = 10 cm. 13 rows = 10 cm. Gauge: 1 cm = 2sts. 1 cm =1.3 rows. Pattern 2. Side of a square is equal to 4.5 cm. Pattern # 1 (darker color) starts at the ham line. Pattern # 3 is the top part of a dress. You can use either single crochet (sc) or double crochet (dc) to crochet the top part of the dress. 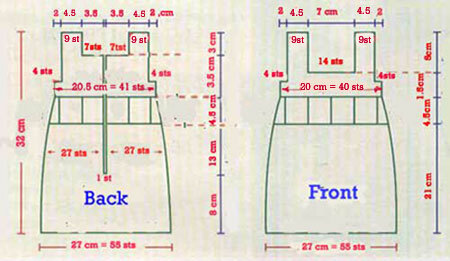 A lower part of a dress is a rectangular 27 cm x 21 cm. To start, you will need: 27cm x 2sts/cm = 54 sts. Add 1 sts to make number of stitches odd. Total number of stitches is 55 sts. 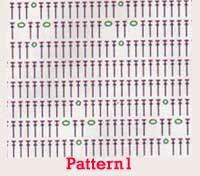 Use Pattern 1 and crochet 8cm (8cm x 1.3 rows/cm = 10 rows) - the point where the button bands will be located later. Close one stitch in the middle of your work, separate all stitches in two parts (27 stitches in each) and continue to crochet each part separately till your rectangular is 21 cm (21 cm x 1.3 rows/cm = 27 rows) tall. Crochet exactly like a back part, but without separating stitches in two parts. Begin a crochet motif from the chain ring made of 4 chains joined into a circle with a slip stitch. Crochet two rows following Pattern 2. You will need nine motifs total, joined in a strip. If one motif is a square 4.5 cm x 4.5 cm, length of a strip will be 4.5 cm x 9 = 40.5 cm. Use your crochet hook to join parts of your baby dress together.